Ariav Schlesinger (CYHSB '10), who currently serves as a מש"ק דת (a non-combat officer responsible for Jewish affairs and religious issues on the base) for the IDF's Duvdevan counter terrorism unit, was recently honored him with an award called מצטיין מפקדת יחידת דובדבן תשע״ג. It is an annual award given to a single member of the combat support staff to recognize excellence in service for non-combatants. 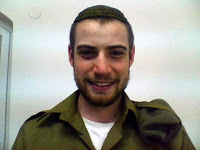 As a religious soldier tending to the spiritual needs of religious and non-religious soldiers and officers alike, we are most proud of Ariav's accomplishment and his dedication to using the Torah values which his family and our school have instilled within him to make the world a better place.